Hands up if you LOVE Martha Stewart *puts hand up! * I DO! I go to her website quite often for inspiration, not just for cakes and recipes but interior decorating an wedding planning (I'm helping a friend plan her wedding at the moment) Martha is amazing! 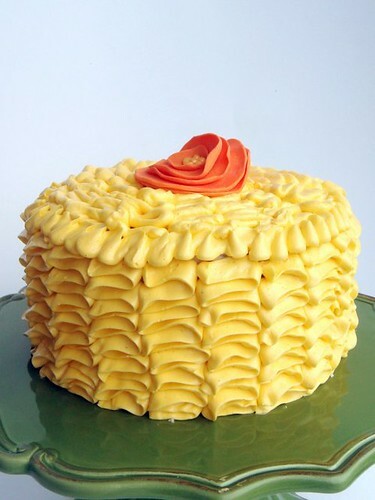 I made this ruffle cake for a friend using some lovely Martha Stewart recipes. Heat oven to 180 degrees C and line one 8" or three 6" cake tins. Sift flour, baking powder, and salt together in a medium bowl and set aside. Beat butter on a medium setting until light and fluffy, about four minutes. Add eggs one at a time making sure to beat well after each addition. Add flour and buttermilk, starting and finishing with the flour. Stir in orange zest and pour batter into cake tin/s. Bake for about 30 minutes or until skewer inserted comes out clean. Cool in tin for 15 minutes then remove and place on cooling rack before icing. In double boiler over simmering water, whisk sugar and egg whites until warm and sugar is dissolved (about 2 or 3 minutes). Transfer egg mixture to a clean bowl and beat on high with whisk attachment until fluffy and cooled (about 10 minutes). Reduce mixer to medium-low; add butter 1/4 cup at a time, beating well after each addition. Switch to a paddle attachment (or normal attachment) and beat on the lowest speed 3 to 5 minutes. I halved the recipe for the Swiss Meringue Buttercream, mainly because (if you live in NZ like me) you would have to be rich to be using a whole block of butter on one cake these days, also because it's fatty! This quantity covered my 6 inch cake using the ruffle technique.